Searching for a party bus in Belleville should never be a stressful event. Thankfully, you have now found the answer that you have been searching for because here at Rockstarz Limousine and Party Bus, we specialize in not only delivering an amazing party bus experience, but we do so with a high level of professionalism as well. Our Belleville party bus rental service is designed to provide you with your very own nightclub on wheels. With our bus, we have sought to make the best use of the space on board to allow you to invite even more guests along than ever before. Also, you don’t have to worry about having somewhere to rest if the party is getting too much either thanks to the luxurious leather seats throughout the bus. We also know that you want an amazing atmosphere for your party, and that is why we have included a top of the range sound system to blast music throughout the bus. When you also add in a laser light show for some extra atmosphere, then you have the makings for an impressive party that is capable of impressing everybody that comes along. Previously, people have sought to use our Belleville party bus service for a wide range of different kinds of celebrations. Of course, there is the usual birthday party, but there are so many other reasons as to why our party bus is going to be the perfect location. An anniversary, a bachelor or bachelorette party, perhaps you just feel like getting some friends together somewhere different? 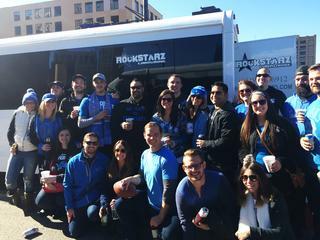 No matter the reason, our party bus can easily accommodate you. So, if you live in the Belleville area and are looking for a party bus, then give us a call today at Rockstarz Limousine and Party Bus. The other option is to use the contact form on our website, and a member of our team will be in touch with you to discuss your own individual requirements.